Etain is an expert on the establishment, structuring, financing and ongoing operation of investment funds. She specialises in alternative investment and related custody, administration and brokerage services. 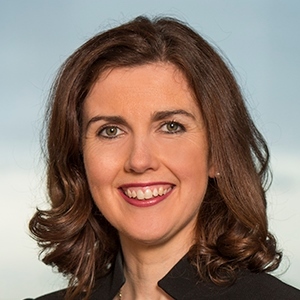 Her practice covers derivatives and securities law and the provision of credit facilities including structured credit to Irish domiciled schemes. Etain’s clients include a wide range of financial institutions carrying out business in Ireland or transacting with Irish-domiciled counterparties from other jurisdictions. Etain’s experience with Dillon Eustace includes a secondment to Goldman Sachs International, Global Securities Services Division. Promoters on establishing traditional and alternative investment funds, including UCITS and QIAIFs. Advice covers a wide range of strategies, including US loan origination activities using Irish vehicles and umbrella platform structures. On the redomiciliation, mergers and consolidation of investment funds to Ireland including the redomiciliation of the first unit trust to Ireland. UCITS Management Companies and Alternative Investment Fund Managers on all aspects of ongoing legal and regulatory compliance, including non-Irish management companies passporting their services into Ireland. On prime brokerage, ISDA, futures and related trading and account management documentation for Irish schemes. Irish domiciled funds of all types on the ongoing legal, regulatory and compliance requirements affecting structure and day to day operation. UK and US prime brokers and other derivative counterparties on Irish legal and regulatory issues relating to the appointment of prime brokers and other OTC counterparties by Irish-domiciled funds and related security and collateral arrangements. On cross-border collateral, netting and insolvency issues connected to derivatives transactions, prime brokerage and close-out on default of counterparties. On the structure and negotiation of financing arrangements for a number of Irish-domiciled schemes including review and negotiation of facility agreements, security documents, ISDA documentation (for structured financing trades) and account control agreements.